Conservation specialists have constructed artificial setts to help the badgers settle away from the AWPR. 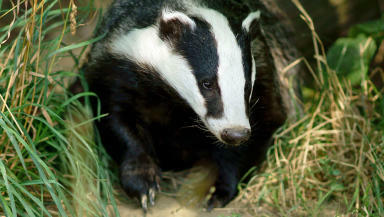 Badger setts will be destroyed to make way for Aberdeen’s long-awaited city bypass. The developers behind the Aberdeen Western Peripheral Route (AWPR) have been forced to re-home badgers living in the path of the road. Workers will begin the process of dismantling the existing setts in September and are expected to complete the work within ten weeks. A spokesman for Transport Scotland said: “As part of our environmental commitments and to minimise the impact of the construction of the project, we are working alongside Scottish Natural Heritage to ensure that protected species such as badgers are able to move to a new habitat away from the line of the AWPR and Balmedie-Tipperty route. “This will ensure badgers are excluded from their present setts and encouraged to move into new setts. Contractors will block access to the setts after encouraging any remaining badgers to leave and relocate. The setts will be regularly monitored to ensure all badgers have been re-homed ahead of their demolition. Badgers and their homes are protected under UK law, but it is possible to apply to Scottish Natural Heritage for a license to destroy setts. The £745m Aberdeen Western Peripheral Route is expected to shave up to 27 minutes off journeys across the north east. It is expected to bring £6bn to the local economy and create around 14,000 jobs in the north east up over the next 30 years. Construction work on the 58km road is due to commence in the autumn and is expected to be completed by spring 2018. The AWPR will consist of four sections; from Stonehaven to Cleanhill, Charleston to North Kingswells, North Kingswells to Blackdog, and Balmedie to Tipperty. Image copyright Peter Trimming and licensed for reuse under Creative Commons License.